When a marketing team from South Africa visited La Digue in the Seychelles in 2006, they happened upon a German artist on the beach. They got chatting and asked him how he would best represent Eden Island, an upcoming destination promising a luxurious second home on one of the world’s most vibrant islands. The artist said he’d think about it and went on his way. The next morning, an executive from the team found a painting deposited outside his hotel room door – it was of a parrotfish, a Seychellois symbol, commonly found but uncommonly beautiful. Thus Eden Island got its rainbow-hued mascot. The Seychelles’s 116th island is replete with such interesting titbits. For instance, it is located on what used to be a coral reef. In 1999, when the coral began to die due to the El Niño effect, the government reclaimed the land and decided to approach investors to develop a man-made island that could offer the tiny African country’s many long-term visitors a place to call home. Smith and team display a seemingly genuine concern for the economic and environmental health of the unspoilt Seychelles Islands. Not only is Eden Island responsible for creating 700 jobs within the local community, but it also represented 40 per cent of the country’s foreign investment in 2014 and 4 per cent of its GDP. The draw of owning a second or investment home here is evident from the moment you pass over the bridge leading to the private island. The marina is crowded with superyachts – in the week I visit, one of these bears the UAE flag. Within, as you drive past Eden Plaza and Eden Bleu, the on-site boutique mall and business hotel, the island seems to close in around you. It’s enormous, yet feels satisfyingly exclusive. Cars are swapped for electrically powered vehicles, which are like golf buggies – all owners get their own personalised buggies to travel to and from their homes, and can ride these over to one of Eden Island’s four beaches, to the community centre or to the pier-facing restaurants, bars and supermarket. Once I am let into the main accommodation arena by security – residents get an access card to pass through the various checkpoints – a warren of lanes stretches out before me. It’s all narrow paths and lush greenery interspersed with views of the postcard blue ocean. The cutesy-sounding “street” names, Cardamom Road, Zarine Avenue, Ambrosine, Jacaranda Lane, add to the sense of island exotica. 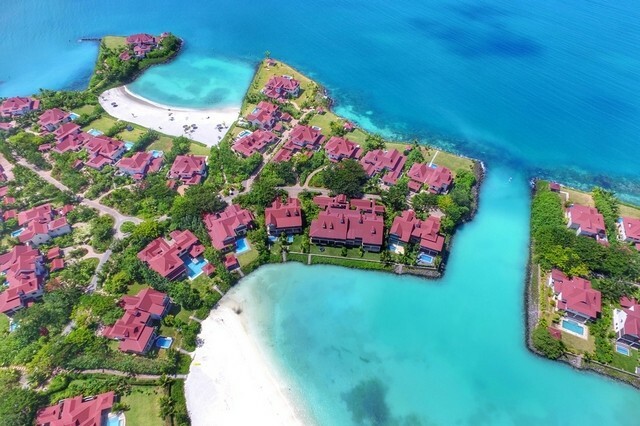 The 138-acre Eden Island is made up of 570 freehold homes in three formats – apartments (one to three bedrooms), maisons (three or four bedrooms) and villas (up to six bedrooms). Of these, 500 have been sold, while the last 20 are still under development. The 50 homes currently on the market are being offered up for between Dh1.67 million and Dh11.38 million, depending on their format, finishing and furnishings. From an airy one-bedroom apartment and three-bedroom duplex maison to a six-bedroom villa with an indoor pool, there’s choice enough for all manner of second-home makers.